The opening paragraph informs you that the book featured in today’s review is Halting State. 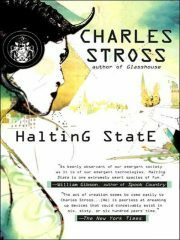 This novel was written by Charles Stross and was published in 2007. You muse on how long ago that was. The book opens with protagonist one, Sergeant Sue Smith. 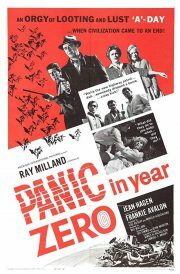 She is summoned to Hayek Associates, who are victims of a robbery that proves much less straightforward than expected. 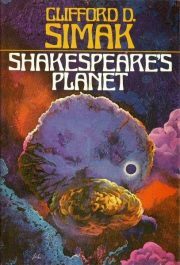 Anne McCaffrey’s 1969’s The Ship Who Sang is a fix-up of SF stories published 1961–1969. Hideously disfigured Helva might have been humanely euthanized, as was routinely done to those outside the norm for her time and place. But she had a brain worth salvaging. Helva survived the conversion process and was reborn as … the brain of interstellar ship XH 834. 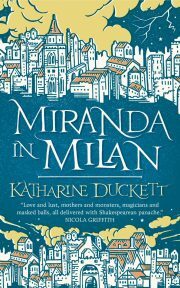 Katharine Duckett’s Miranda in Milan is a standalone historical fantasy novella. It is Duckett’s book debut1. Restored to his dukedom, Prospero returns to Milan, bringing with him his daughter Miranda. 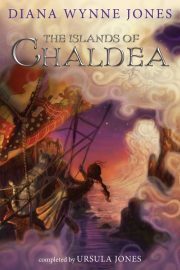 Miranda was raised on Prospero’s uncharted island and finds Milan a bewildering, alien city. A bewildering, alien, and hostile city. 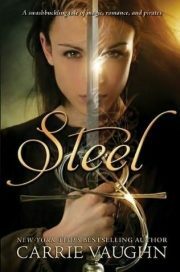 Carrie Vaughn’s 2012 Steel is a standalone young-adult time travel story. Jill Archer comes in fourth in her fencing tournament. Third would have earned her a bronze medal and a place in the Junior World Fencing Championships. Fourth gets her nothing. A family vacation near Nassau should help her get over the setback. 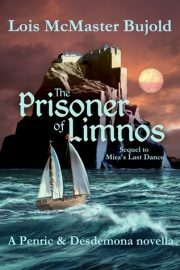 But a chance discovery of the broken tip of a rapier, lost to the sea centuries ago, gives her a ticket to an entirely different sort of vacation. Clutching the fragment she has rescued from the water, she falls overboard in the 21st century. She is hauled out of the water in the golden age of piracy. 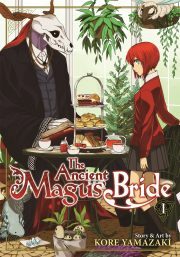 The Ancient Magus’ Bride, volume 1 collects the first five issues of Kore Yamazaki’s ongoing manga Mahō Tsukai no Yome. Abandoned by her parents, despised by her peers, and plagued by visions she does not understand, high school student Chise Hitori decides to sell herself into slavery. That way, at least, she will have a place in the world. The bidding is heated. At the end of it, Chise is the property of mage Elias Ainsworth, a British person of sufficient means to pay five million pounds sterling for Chise. Well dressed and unflappably polite, Elias is a striking figure. 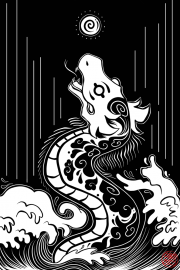 The Dragon is the second half of the original 1963 hardcover edition of Jane Gaskell’s The Serpent, which in turn is the first part of the Atlan series. Publishers, am I right? 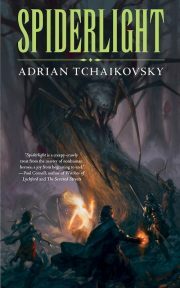 Let’s call it book two of the Atlan series and move on. Thanks to the tumultuous events towards the end of the previous instalment, Cija is on the run. She manages to hide in plain sight, as her friend Smahil’s lover. Smahil insists on making this pretense real. It’s probably for the best that Cija does not know that Smahil is her half-brother. 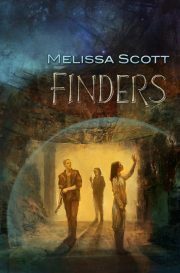 2018’s Finders is the first volume in Melissa Scott’s Firstborn, Lastborn series. The Ancestors disappeared millennia ago, leaving behind some garbled myths and the scattered relics of their nigh-godlike technology. Cassilde Sam and her partner Dai Winter make their meagre living tracking down and salvaging Ancestor relics. It’s a hard life, but not one that Cassilde will have to endure much longer. Third-stage Lightman’s will soon end her life. There is no treatment for Lightman’s. Cassilde is desperate to secure financial security for Dai before she dies. 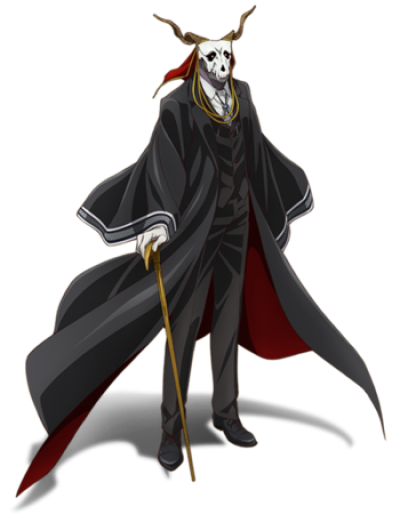 An opportunity presents itself, but it comes at a high price: accepting scholar Summerlad Ashe as a partner once more. 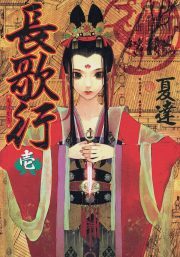 Choukakou, which is also known as Chang Ge Xing, Chang Ge’s Journey or Song of the Long March, is an ongoing manhua (Chinese comic) series by Xia Da. 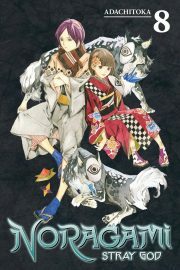 Volume one collects the first four issues. Seeking to succeed to the throne in the newly born Tang Dynasty, Li Shimin murders his brothers Crown Prince Li Jiancheng and Prince Li. To prevent future unpleasantness, Li Shimin has his brothers’ families massacred as well. Later centuries will remember Li Shimin as Emperor Taizong of Tang, one of China’s most capable emperors. Mission accomplished! Save for one small detail. Terry Nation’s Blake’s 7 is a dystopian SF television series. It originally aired between 1978 and 1981. “The Way Back,” written by Michael E. Briant, aired on January 2nd, 1978. Roj Blake is a seemingly unremarkable member of society. Blake’s friend Ravella is determined to convince Blake otherwise. 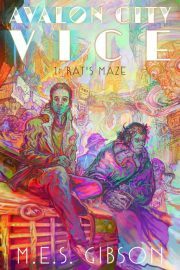 2018’s Rat’s Maze is the first volume in M. E. S. Gibson’s Avalon City Vice fantasy-noir series. Humans come to Avalon City in search of magical wonders. They bring with them human vices like drugs. Confronted with unfamiliar challenges, the ferals native to Avalon City have responded by copying human solutions. Thus the Avalon City Police Department. Thus ACPD Vice, charged with containing the city’s drug trade. Detective Reis “Rat” Attalus is a vice cop. His partner just died and the week looks like it is only going to get worse. 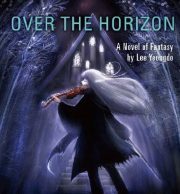 Lee Yeongdo’s Over the Horizon is a fantasy novella. It is also the sole translated example of Yeongdo’s work that I could find. Sheriff Yiphari may only be a small town sheriff, but when he learns of Professor Mataphi’s uncharacteristically pugilistic behavior, the orc instantly realizes there can only be one correct course of action: send his assistant Tyr out into the raging winter storm. Tyr is to walk twelve miles to the professor’s home and there demand an explanation. Mataphi spins a tale of woe and violins. 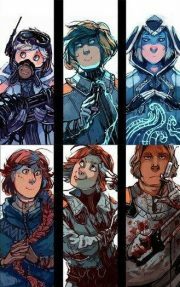 Minna Sundberg’s Stand Still, Stay Silent is an on-going fantasy webcomic. Ninety years ago, a mysterious contagion known as the Rash swept across the Earth, infecting almost every mammalian species. Those not lucky enough to die were transformed into hideous monsters. Inside the Known World — Iceland, Norway, Denmark, Finland and Sweden — a quarter of a million humans survive. The rest of the planet is deemed the Silent World and sensible humans, particularly those without inborn immunity to the Rash, avoid it. The Council-provided budget is smaller than the backers of the proposal had hoped. The backers set out to recruit affordably priced volunteers from the ranks of the foolish, the desperate, the poorly informed, and the expendable. Enter Tuuri Hotakainen (driver/mechanic), Lalli Hotakainen (scout/mage), Emil Västerström (cleanser/pyromaniac), Sigrun Eide (commander), and Mikkel Madsen (medic/cook/voice of reason). 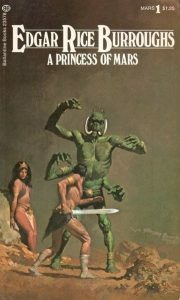 1912’s A Princess of Mars is the first book in Edgar Rice Burroughs’ interminable Barsoom series. Having fought on the losing side of the Slavers’ Uprising, Captain John Carter heads west to see what he can steal from North America’s indigenous population. Cornered by a Native American warband, death seems inevitable … but as is the way of portal series, Carter finds himself transported to an entirely unfamiliar world. Carter is on dying Mars, or as its inhabitants call it, Barsoom. Yato, newly minted god, vanishes. 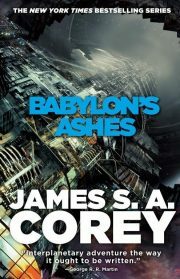 2016’s Babylon’s Ashes is the sixth book in James S. A. Corey’s Expanse series. 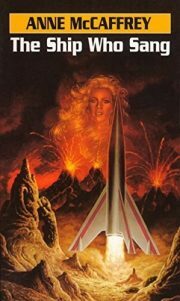 Earth is in ruins; half the population is dead thanks to the Welter Free Navy’s asteroid attack. Neither the UN or Martian space navies are powerful enough to crush the Free Navy, which is supported by close to half of the population in the Outer Planets Alliance. The Free Navy controls the gates to humanity’s extra-solar colonies. Marco Inaros is the mastermind behind the Free Navy. Everything is going Marco’s way. Just ask Marco.